1دانشجوی کارشناسی ارشد، زراعت، دانشگاه فردوسی مشهد. 2دانشیار گروه زراعت و اصلاح نباتات، دانشکده کشاورزی، دانشگاه فردوسی مشهد. 4استاد، گروه زراعت و اصلاح نباتات، دانشکده کشاورزی، دانشگاه فردوسی مشهد. به منظور بررسی تأثیر کود شیمایی و کودهای آلی به‌همراه مصرف میکروارگانیسم‌های مؤثر (EM) بر خصوصیات بنه‌ی زعفران، آزمایشی در سال زراعی 93-1392 در قالب طرح بلوک‌های کامل تصادفی با سه تکرار و 16 تیمار در شهر ریوش اجرا گردید. فاکتورهای آزمایشی شامل 1-کود شیمایی (حاوی 12 درصد ازت از منبع اوره و نیترات، 8 درصد فسفر، 4 درصد پتاسیم و کلات‌های آهن، روی، منگنز و مس) 2- کود دامی 40 تن در هکتار 3- کود دامی 40 تن در هکتار+ EM 4- کود دامی 80 تن در هکتار 5- کود دامی 80 تن در هکتار+EM 6- ورمی‌کمپوست 10 تن در هکتار 7- ورمی‌کمپوست 10 تن در هکتار+EM 8- ورمی‌کمپوست 15 تن در هکتار 9- ورمی‌کمپوست 15 تن در هکتار+EM 10- ورمی‌کمپوست 20 تن در هکتار 11- ورمی‌کمپوست 20 تن در هکتار+EM 12- ورمی‌واش 13- ورمی‌واش+‌EM 14- کود دامی 40 تن در هکتار+ورمی‌واش 15- کود دامی 40 تن در هکتار+ ورمی‌واش+EM و 16- شاهد (عدم مصرف کود) بود.نتایج تجزیه واریانس حاکی از اثرات معنی‌دار تیمارهای کودی بر صفات مورد بررسی زعفران به استثنای تعداد کل بنه‌های دختری بود.بر اساس نتایج آزمایش، بیش‌ترین افزایش در عملکرد کل بنه‌های دختری (715 گرم در مترمربع)، تعداد بنه‌های دختری بیش‌تر از 8 گرم (57 بنه در مترمربع)، در نتیجه‌ی کاربرد کود شیمیایی حاصل شد که این تأثیر با اثر کود دامی 40 تن در هکتار+ورمی‌واش+EM برابری کرد. بر اساس نتایج مقایسات گروهی کاربرد EM همراه با ورمی‌کمپوست و کود دامی نسبت به مصرف ورمی‌کمپوست و کود دامی به تنهایی به‌طور معنی‌داری باعث کاهش صفات مورد بررسی زعفران شد. An experiment was conducted based on randomized complete block design with three replications at a field located in the Rivash town in the Khorasan Razavi province during the growing season 2013-2014 in order to compare and evaluate the effects of chemical fertilizer (Containing 12% N from Urea and nitrate sources, 8% P, 4%K and also Zn, Cu, Mg, Fe, Chelates), vermiwash and different levels of manure and vermicompost fertilizer with the use of biological EM (effective microorganisms) on the characteristics of corm in Saffron. Treatments included: 1.fertilizer chemical (containing 12% nitrogen from urea and nitrate, %8-P, 4% potassium and chelates together iron, zinc, manganese and copper) 2.Manure 40 t.ha-1, 3.manure 40 t.ha-1 + EM, 4.manure 80 t.ha-1, 5.manure 80 t.ha-1 + EM, 6.vermicompost 10 t.ha-1, 7.vermicompost 10 t.ha-1 + EM, 8.vermicompost 15 t.ha-1, 9.vermicompost 15 t.ha-1 + EM 10.vermicompost 20 t.ha-1 , 11.vermicompost 20 t.ha-1 + EM, 12.vermiwash, 13.vermiwash+ EM, 14.Manure 40 t.ha-1+ vermiwash, 15.Manure 40 t.ha-1 + vermiwash + EM, 16.Control (no fertilizer application). The results of analysis of variance showed a significant effect of treatments on all of the characteristics with the exception of the total number of saffron corms. The results indicated that the highest increase in total yield of corm (715 g.m-2), corm number more than 8 grams (57 corms.m-2), was obtained as a result of the use of chemical fertilizers and was equal to the combined application of Manure 40 t.ha-1+ vermiwash + EM. The orthogonal comparisons showed that the use of EM with vermicompost and manure versus using vermicompost and manure alone significantly reduced the traits of saffron. Ansari A.A. 2008. Effect of vermicompost and Vermiwash on the productivity of spinach (Spinacia oleracea), onion (Allium cepa) and potato (Solanum tuberosum). World Journal of Agricultural Sciences 4 (5): 554-557. Ansari, A.A., Pereira, M., and Jaikishun, S. 2015. Effect of vermiwash obtained from different sources (neem, rice straw and bagasse) and standardized hydroponics solution on the growth of Colocasia esculenta (Australian Poi) in Guyana. American journal of experimental agriculture 7 (5): 275-283. Arancon, N.Q., Edwards, C.A., Bierman, P., Metzger, J.D., and Lucht C. 2005. Effects of vermicomposts produced from cattle manure, food waste and paper waste on the growth and yield of peppers in the ﬁeld. Pedobiologia49: 297-306. Bachman, G.R., and Metzger, J.D. 2008. Growth of bedding plants in commercial potting substrate amended with vermicompost. Bioresource Technology 99: 3155-3161. Bajwa, R., Javaid, A., and Rabbani, N. 1999. EM and VAM technology in Pakistan. VII: Effect of organic amendments and effective microorganisms (EM) on VA mycorrhiza, nodulation and crop growth in Trifolium alexandrianum L. Pakistan Journal of Biological Sciences 2: 590-593. Coleman, D.C., and Crossley, D.A.1995. Fundamentals of soil ecology. Academic Press, San Diego and London. Eghball, B. 2002. Soil properties as influence by phosphorus and nitrogen-based manure and compost application. Agronomy journal 94: 128-135. Daiss, N., Lobo, M.G., Socorro, A.R., Brückner, U., Heller, J., and Gonzalez, M. 2008. The effect of three organic pre-harvest treatments on Swiss chard (Beta vulgaris L. var. cycla L.) quality. European Food Research and Technology 226: 345-353. Daly, M.J., and Stewart, D.P.C. 1999. Influence of effective microorganisms (EM) on vegetative production and carbon mineralization- a preliminary investigation. Journal of Sustainable Agriculture 14: 15-25. Gutierrez-Miceli, F.A., Oliva Llaven, M.A., Nazar, P.M., Sesma, B.R., Alvarez-Solis, J.D, and Dendooven, L. 2011. Optimization of vermicompost and worm-bed leachate for the organic cultivation of radish. Journal of plant nutrition 34: 1642-1653. Higa, T. 2000. What is EM technology?. EM World Journal1: 1-6. Higa,T., and Wididana, A.N. 1991. Changes in the soil micro flora induced by effective microorganisms. p, 153-162. In: Parr, J.F., Hornick, S.B., and Whitman, C.E. (ed. ), Proceedings of the First International Conference on Kyusei Nature Farming. U.S. Department of Agriculture, Washington. D.C., USA. Hussain, T., Anjum, A.D., and Tahir, J. 2002. Technology of beneﬁcial microorganisms. Nature Farming and Environment 3: 1-14. Javaid, A., and Shah, M.B.M. 2010. Growth and yield response of wheat to EM (effective microorganisms) and parthenium green manure. African journal of biotechnology 9 (23): 3373-3381. Koocheki, A., Jamshid Eyni, M., and Seyyedi, S.M. 2014a. The effects of mother corm size, manure and chemical fertilizers on replacement corm criteria and yield of saffron (Crocus sativus L.). Journal of Saffron Research 2 (1): 34-46. (In Persian with English Summary). Koocheki, A., Seyyedi, S.M., Azizi, H., and Shahriyari, R. 2014b. The effects of mother corm size, organic fertilizers and micronutrient foliar application on corm yield and phosphorus uptake of saffron (Crocus sativus L.). Saffron Agronomy and Technology 2 (1): 3-16. (In Persian with English summary). Krishnamoorthy, R.V., and Vajranabhiah, S.N. 1986. Biological activity of earthworm Casts an assessment of plant growth promoter levels in casts. Proceedings of Indian academy of Sciences (animal Science) 95: 341-351. Melnyk, J.P., Wang, S., and Marcone, M.F. 2010. Chemical and biological properties of the world’s most expensive spice: Saffron. Food Research International 43: 1981-1989. Mohammad poor, J., Ghodsi, M.R., Esmi, R., Shariatmadadi, Z., Adib, M.R., and Jahedi poor, S. 2013. Evaluate the effects of irrigation and fertilization on morphological traits and yield of saffron crops. Second National Conference on the latest scientific achievements of saffron. 8 December 2013. Torbat Heydarieh, Iran. (In Persian). Ortega, R., and Fern´andez, M. 2007. Agronomic evaluation of liquid humus derived from earthworm humic substances. Journal of Plant Nutrition 30: 2091-2104. Rashed Mohassel, M.H., Azizi, G., and Sabet Teimouri, M. 2006. Investigation on saffron reaction to mineral and organic fertilizers. Book of Abstracts. 2nd International Symposium on saffron biology and technology, 28-30 October 2006. Mashhad, Iran. (In Persian). Rezaian, S., and Paseban, M. 2006. The effect of micronutrients and manure fertilizers on the quantity and quality of Khorasan saffron. In Proceedings 2nd International ymposium on Saffron Biology and Technology. 28-30 October 2006. Mashhad, Iran. (In Persian). Rezvani Moghaddam, P., Koocheki, A. Molafilabi, A. and Seyyedi, M. 2013a. Effect of biological and chemical fertilizers on replacement corm and flower yield of saffron (Crocus sativus L.). Iranian Journal of Crop Sciences 15 (3): 234-246. (In Persian with English Summary). Rezvani Moghaddam, P., Khorramdel, S., Amin Ghafori, A., and Shabahang, J. 2013. Evaluation of growth and yield of saffron (Crocus sativus L.) affected by spent mushroom compost and corm density. Journal of Saffron Research 1 (1): 13-26. (In Persian with English Summary). Suthr, S. 2010. Evidence of plant hormone like substances in vermiwash: An ecologically safe option of synthetic chemicals for sustainable farming. Ecological Engineering 36: 1089-1092. Teimori, M., Kafi, M., Orseji, Z., and Oreji, K. 2010. Effect of drought stress, the size and coverage of corms on morphoec physiological characteristics of saffron (Crocus sativus L.) in greenhouse . Journal of Agroecology 2 (2): 323-334. (In Persian). Teimori, S., Behdani, M.A., Ghaderi, M.G., and Sadeghi B. 2013. Investigation on the effect of organic and chemical fertilizers on morphological and agronomic of saffron (Crocus sativus L.) corm criteria. Journal of Saffron Research 1 (1): 36-47. (In Persian with English summary). Xu, H., Wang, R., and Mridha, M.A.U. 2000. Effects of organic fertilizers and a microbial inoculant on leaf photosynthesis and fruit yield and quality of tomato plants. Journal of Crop Production 3 (1): 173-182. Yan, P.S., and Xu, H.L. 2002. Inﬂuence of EM Bokashi on nodulation, physiological characters and yield of peanut in nature farming ﬁelds. Journal of Sustainable Agriculture 19: 105-112. Yasmin, S., and Nehvi, F.A. 2013. Saffron as a valuable spice: A comprehensive review. African Journal of Agricultural Research 8 (3): 234-242. Zanzucchi, C. 1987. Research carried out by the consorzio comunalie paramensi on saffron (Crocus sativus L.). pp. 347-395. 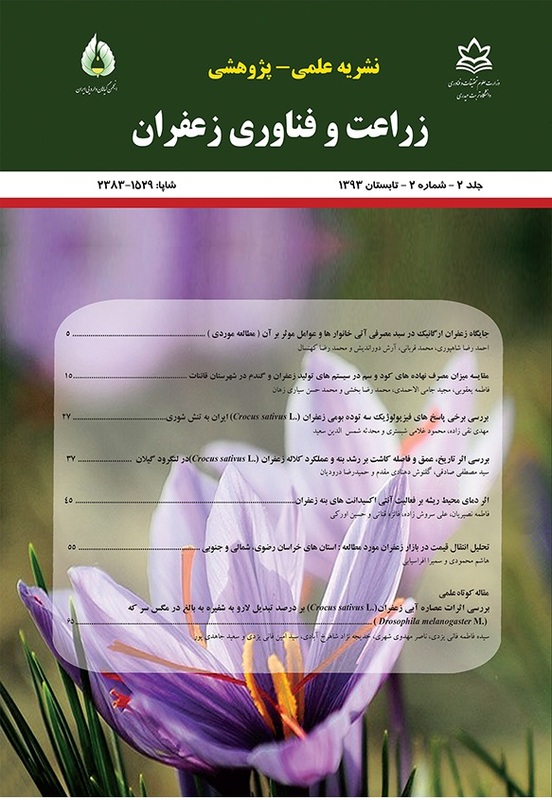 Zarea Feizabadi, A., Jamali, S.M., Taheri, Gh., and Khazaei, H., 2012. Effect of manure and biological substrate on quantitative charactristics of bread wheat (Tritticum aestivum). Journal of Agroecology 2 (1): 63-74. (In Persian with English summary).